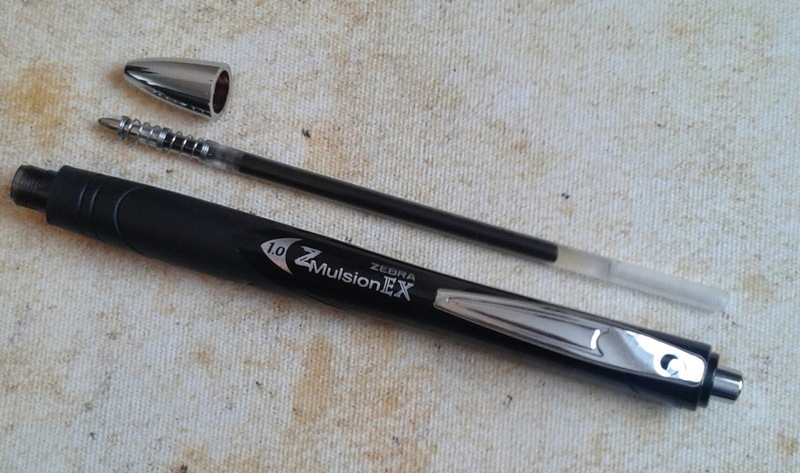 I bought this Zebra Z-Mulsion Ex for £1 at Asda today. The pen is mainly plastic, with a rubber grip and a metal clip, which I originally thought was plastic too but after some light tapping against my teeth, it appears it is actually metal. The pen uses Zebra's oil and water emulsion which is "optimised for super-smooth ink glide" and a smooth ink glide is exactly what you get. This is no ordinary ballpoint. It's much more inky, so much so that I felt I was actually using a rollerball. I guess thats the Emulsion ink working it's magic. The ink dries superfast, and as a left hander this is important. I don't want unsightly smudges all over the page. This pen is almost too smooth. Theres next to no resistance on the paper, along with the fact the pen weighs very little, I was in danger of losing control and allowing the pen to take over. I managed to show the Zebra who was boss and order was restored. The ink flow is consistant every time I pick this pen up. This is a pen I feel I can rely on for important tasks like notetaking and not find myself scrambling about in my bag for a back up. 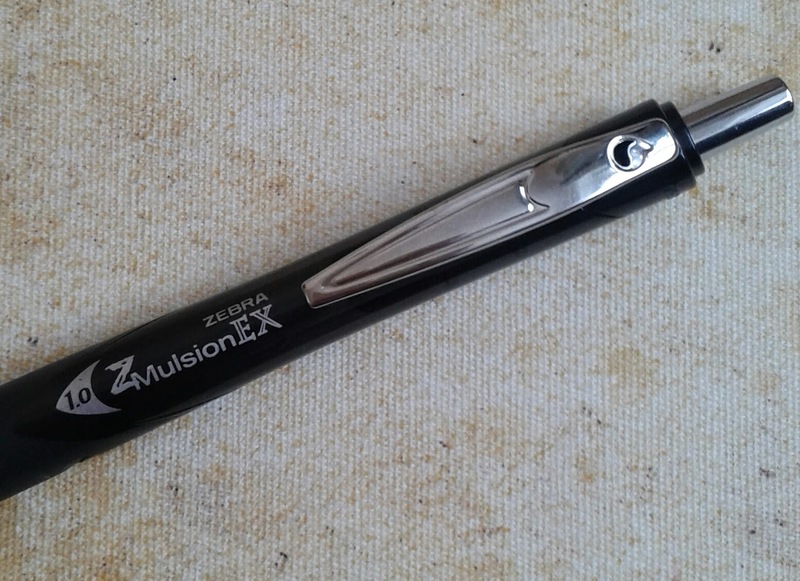 The Z-Mulsion Ex is refillable with a Zebra EQ refill. To refill, just unscrew the tip and pop a new refill in, careful not to lose the spring. All in all, it's a great pen. It looks smart, its reliable, and feels nice to use. For the price I paid, I'm one happy bunny. 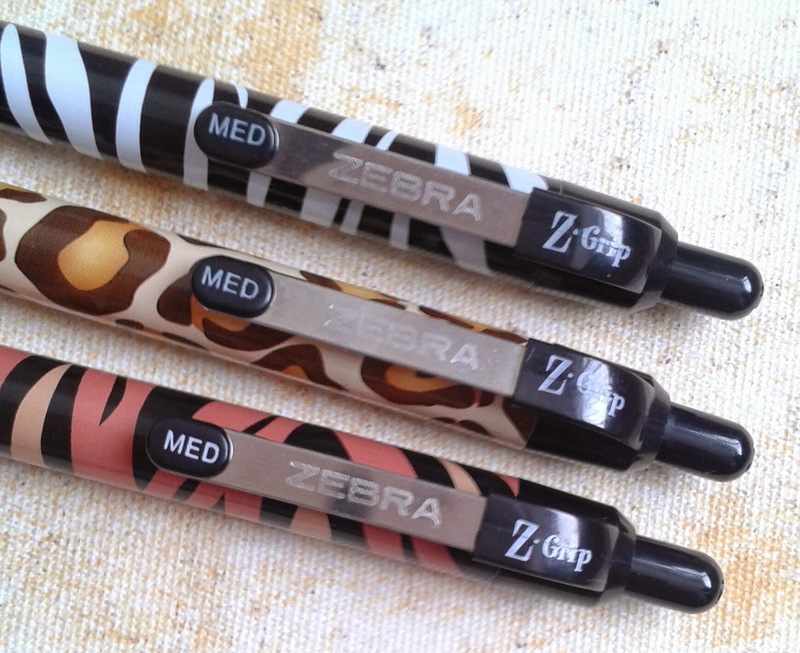 I got these Zebra Z Grip Animal pens in my Christmas stocking. My family have come to accept my pen obsession, even if they don't quite understand it and they know they can't go wrong with pens. The fab, snazzy designs really catch your eye. If I saw someone using one of these I'd immediately know it was a Zebra. The designs are Zebra, Cheetah (which for ages I actually thought was a Giraffe) and a Tiger. 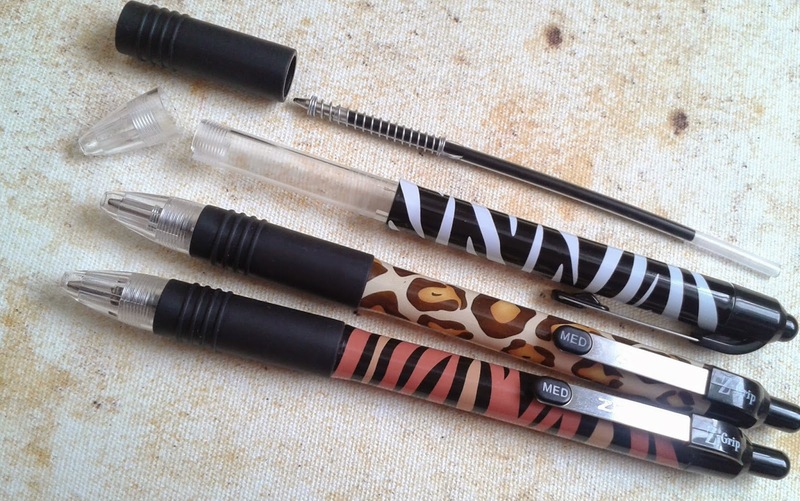 They have a rubber ribbed grip which is comfortable enough to hold and metal clips with Zebra etched onto them. The clips are quite flexible so unless they are clipped to something reasonable thick, I don't completely trust them. I have major meltdowns when I lose a pen so I'd be constantly checking to make sure it's still there. Best stored in my handbag or pocket I think. Fun design aside, I'd say these pens are not much different from any other ballpoint pen within the same price range. They write smoothly, there's no scratching, the ink flow is good. I haven't had to do any scribbling to get them going. All in all they are decent pens. Nothing out of the ordinary though. But then I wasn't looking for anything amazing. I like the pens and they do exactly what I expect them to do. 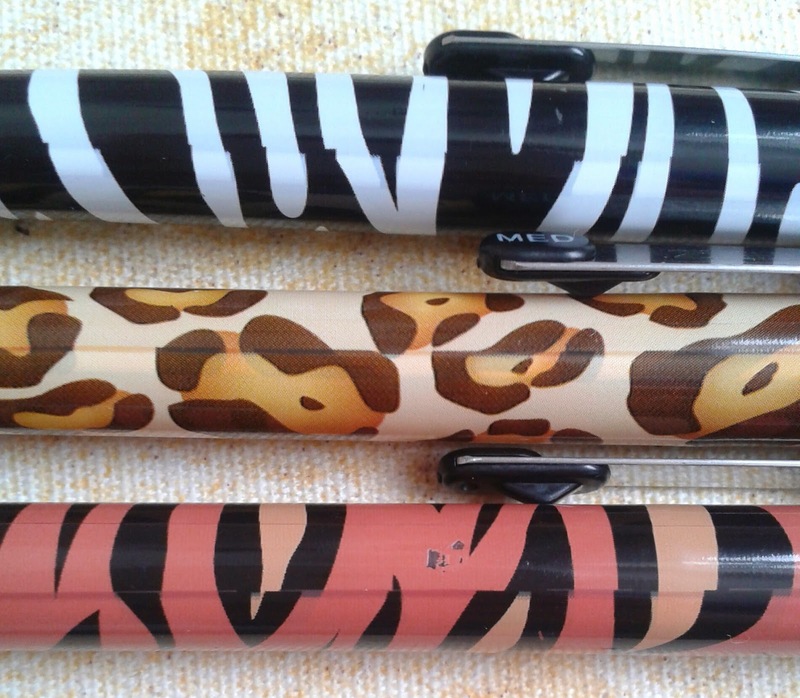 The Zebra Z Grip Animals are not refillable with their own refill, but I don't see why you couldn't replace the ink from another less interesting pen if its the same size. I always think it's such a shame when a pen reaches retirement so I try to prolong their life wherever I can. What good is a pen if you can't use it? slightly mismatched but who cares? If I could change one thing about these pens? It would be the line where the pattern joins up. It's not a big deal. It doesn't affect me or the way the pen works in any way, I'd just rather not see it. 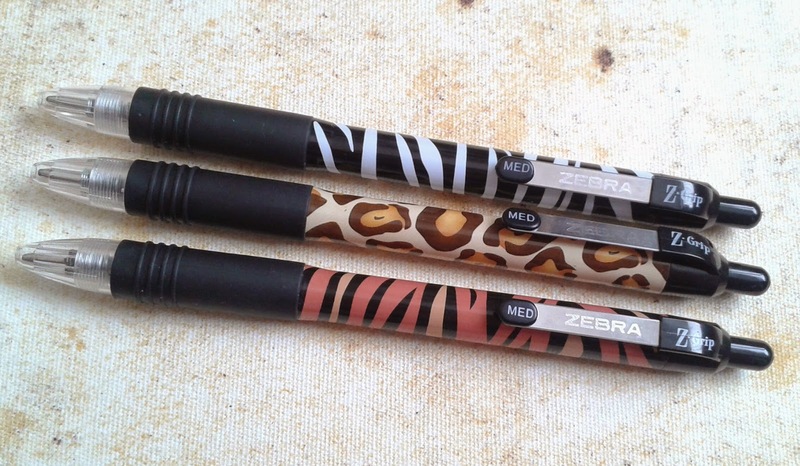 I'd still recommend these Zebra pens. They are fun, and everybody should have at least one Zebra in their life. 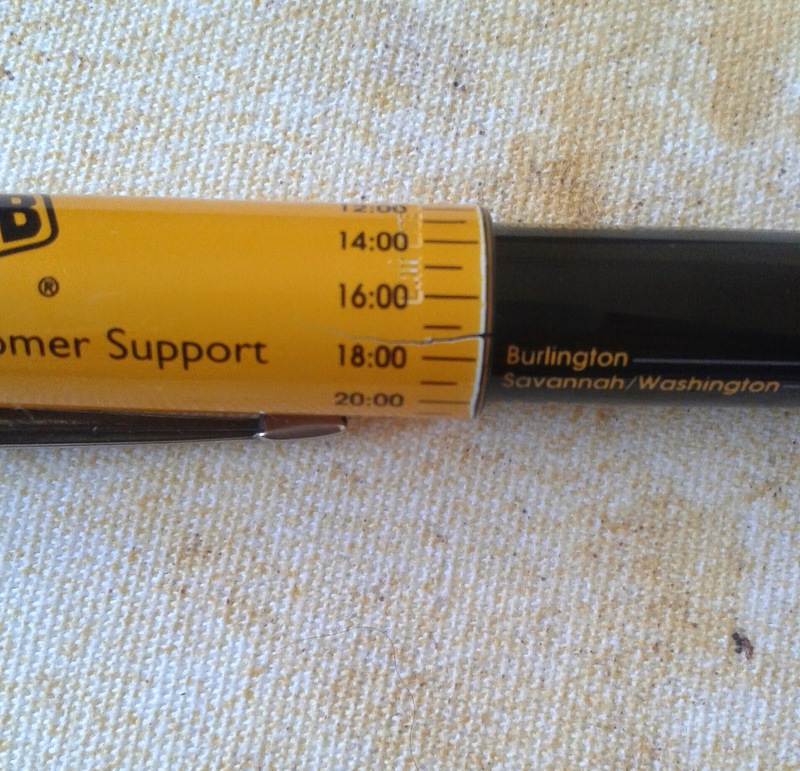 I got this Parker pen from my Dad, who got it from work. I love the design. 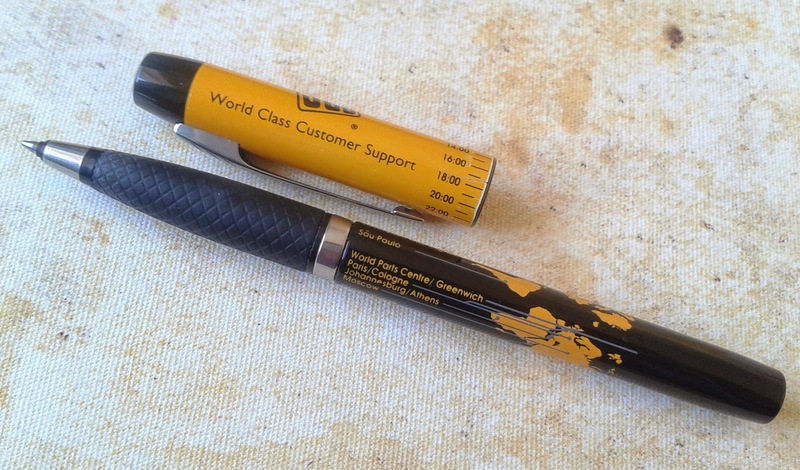 The lid says 'JCB World Class Customer Support' and the barrel which is the most interesting part, shows the major cities around the world. By matching the cities up to the times on the lid you can see the time zone differences around the world. It's pretty cool. 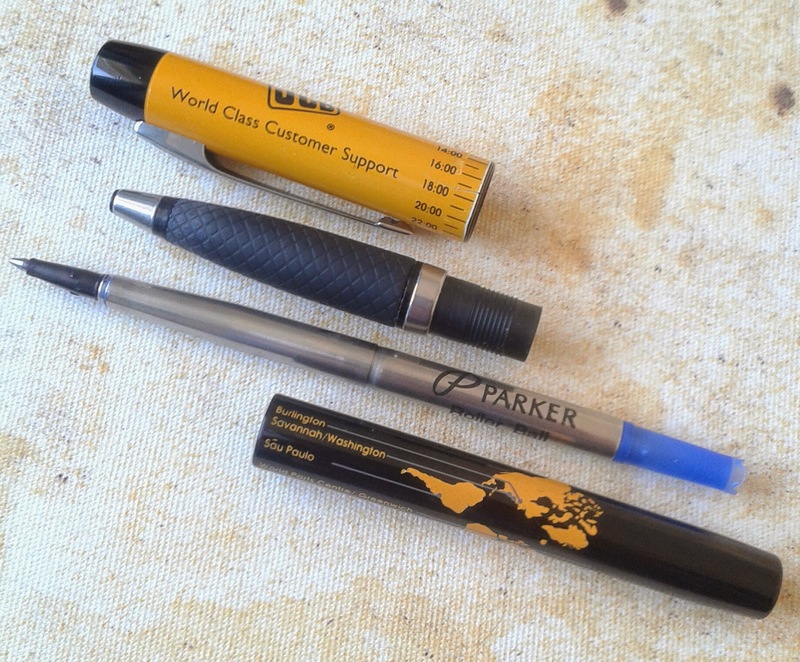 The JCB Parker is mostly plastic with a rubber grip which is extremely comfortable to hold. The grip is long enough so that it doesn't matter how I hold the pen, it always feels comfortable and soft on my fingers. 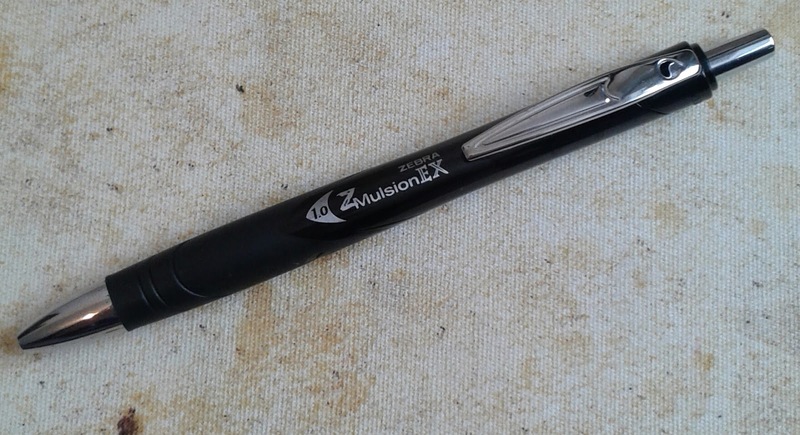 It's a lightweight pen so together with the excellent grip I can write for a lengthy period of time, without experiencing any sort of hand fatigue. Depending on what angle I'm holding my Parker, it can sometimes feel a little scratchy on paper. I do think it depends on the paper too. I find that when in a scratchy mood, it writes much smoother if held in a more upright position. The ink flow is perfect from any angle and dries super fast. To refill, just unscrew in the middle and the refill will slide out, ready for its replacement. Sadly I've cracked the lid. This has happened over time, not through heavy handedness, just general wear and tear which is such a shame. As soon as I saw the first hint of a crack I was extra careful but it didn't make any difference. Despite the crack in the lid and the occasional scratchyness, I've become quite attached to this pen. It's not a pen you can get hold of just anywhere, in fact I've not seen another like it so if you have one, let me know!